Welcome to the Corvette Trader Classifieds. This site is designed to give all Corvette owners and lovers a simple and efficient place to buy and sell classic and late model Corvettes. Buyers can quickly locate the car they are looking for by browsing through the categories broken down by Corvette generation. Sellers have a fast and easy way to enter their ads and attach photos to help sell their Vette. If you have any questions please feel free to contact us. There are a few different packages for listing your Corvette for sale including a free option. Please see the pricing page for more info. If you are a dealer please contact us for special dealer rates for posting multiple ads. 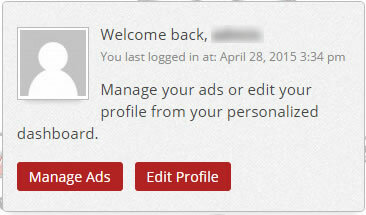 To Edit your existing ad you will need to be logged into your account. You can click on the [My Dashboard] link at the top right of page or you can click on “Manage Ads” on the right next to Corvette Categories on home page. Feature your ad – This will feature your ad on the slider at top of home page and top of chosen category. Bump you ad – This will move your ad to top of category list until someone places another ad in that category or bumps their ad after you. You do not need to register to view ads or to reply to ads. You do need to register for an account to place an ad to sell your Corvette. Registration is quick, easy and free. CorvetteTraderClassifieds.com will not share your info with anyone except where your public info is view-able on this site. Bumping your ad will move your ad to top of search / category results to get better exposure. You can bump your existing ad by clicking the “bump up arrow” icon located at top and bottom of your ad. You will need to wait 24 hours after first placing your ad to bump it. Please be aware that if another seller bumps their ad in same category after you, their ad will be on top of yours. Also, bumping your ad is not the same thing as featuring your ad and your bumped ad will not show in featured slider unless you also have featured your ad. Bumping your ad cost is $2. How can I get more exposure for my Corvette? You can get more exposure for your Corvette for sale in a few different ways. You can “Feature” your ad. You can “Bump” your ad. You can add up to 10 photos to your ad. Make sure to include all angles of exterior, a few interior shots, and a few of engine bay. Place an ad on your local Craigslist.org for free. You can copy and paste the url of your ad on this site into your description on craigslist.org . Use the “Print a Flyer” link to print out copies of your ad to pass out at car shows and post on local bulletin boards in supermarkets, etc.